Full press release details for Babylon 5 - Lost Tales and Supernatural - Series 2 - Part 2 have been added to the Incoming database. Second Sight will release two classic Karloff and Lugosi Universal horror movies on DVD on October the 29th: The Raven and The Black Cat. The discs have a frankly extortionate RRP of £15.99 each. Film4 will release twenty-five films on DVD on September the 17th. They are initially being promoted at budget prices, to celebrate Channel 4's 25th anniversary. Three of the films will have bonus features: Rita, Sue and Bob Too will have a twenty-five minute documentary on director Alan Clarke; Wish You Were Here features a new interview with director David Leland; and Secrets and Lies has an introduction by director Mike Leigh, and a twenty-five minute short film, A Sense of History, starring Jim Broadbent. One film in the collection, P’Tang Yang Kipperbang, is making its DVD debut. Note that September the 17th is the correct date - they were originally announced as being due on the 24th. No technical details were announced. 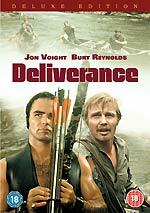 Warner Home Video has announced that they will be releasing a re-mastered 35th Anniversary Deluxe Edition version of John Boorman's classic 1972 action movie Deliverance on September the 17th (a day before the Region 1 release). The film will be presented in anamorphic 2.40:1 format, with Dolby Digital 5.1 audio. The disc will feature a commentary track by Boorman and several featurettes: The Beginning (a look at the novel, and its adaptation as a film); The Journey (production); Betraying the River (focussed on "one of the most controversial and ground-breaking sequences in film history"); Delivered (a retrospective look at the film and its impact); The Dangerous World of Deliverance (behind-the-scenes documentary); and a theatrical trailer. The RRP is £12.99. Blu-ray and HD DVD versions will be released in the US on September the 18th. 2 Entertain will release eight episodes of Aardman Animation's Shaun The Sheep on DVD on September the 17th. The disc will also feature "extras", and has an RRP of £12.99. Tartan has changed the release dates for a number of their titles, including their forthcoming Blu-ray titles, Black Book and Oldboy (again). You can find details using the Incoming database.